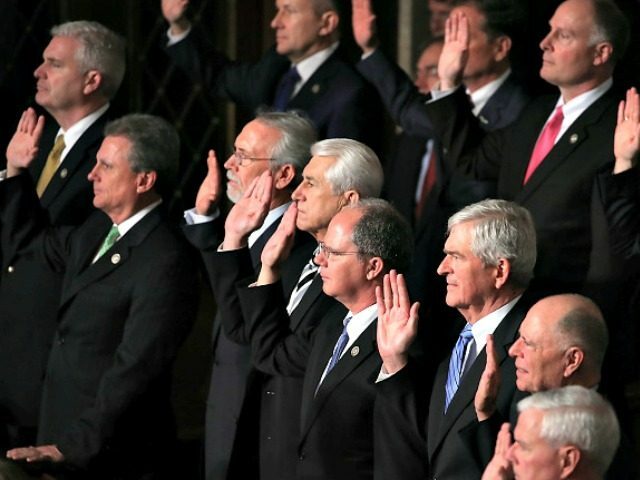 Pew Research Center on Thursday released the results of an analysis on Congress’s productivity showing that, despite Republican control of the White House and both chambers, the legislative body is the fourth least productive in three decades. The report also looked at what laws are “substantive,” measured by whether they changed federal law or used taxpayer funding. In 2005, the first year of the GOP-controlled 109th Congress and with Republican George W. Bush in the White House, 161 laws were enacted, 124 of them substantive. By 2009, the first year of the 111th Congress, Democrats were in control of the House and Senate and Obama was president. That year, 125 bills became law, though only 79 were substantive. The GOP-led 115th Congress enacted a total of 97 laws last year, the fourth-fewest for the first calendar year of a congressional session in the past three decades. That was 18 fewer than in 2015, the first year of the 114th Congress, when Democrat Barack Obama was president and Republicans ran both the House and Senate. Pew’s analysis also shows that Congress enacted the sixth-fewest “substantive” laws — 83 — in its first year, which number is six less than 2015. Pew cites the $1.5 trillion Tax Cuts and Jobs Act, which Congress passed in December, as the most significant of the 115th session, which not only reduced income taxes on individuals and businesses but included a repeal of the Obamacare mandate requiring Americans to buy health insurance or face fines from the Internal Revenue Service. “But getting rid of the individual mandate, while significant, is short of Republicans’ original goal: to “repeal and replace” Obama’s signature accomplishment entirely,” Pew reported. Pew also considers substantive laws Congress has passed to include: a sanctions bill targeting Russia, Iran and North Korea; a law that improves veterans’ educational benefits; legislation to improve weather predictions; and the first comprehensive NASA authorization bill in more than six years. The latter includes the goal of sending humans to Mars by 2033, Pew reported. Pew noted that the bill count includes only those signed into law by Dec. 31, 2017, with 20 bills remaining on President Donald Trump’s desk at the close of the year. Eleven of those bills have been signed, but nine are still pending.